with foods from Italy, but originates from another country and can be found in a plethora of varieties around the world. Tune in for the Vermont Garden Journal to learn some interesting facts and interesting myths about basil, as well as some handy gardening tips. I’m Charlie Nardozzi and this is the Vermont Garden Journal. While basil is mostly associated with foods from Italy, it actually hales from India and has many uses beyond food. In India it’s held in such great esteem that people in courtrooms swear oaths upon it. In Greece and England it was used by kings for therapeutic baths. In fact, ‘holy’ basil is used medicinally in many countries. In Romania eating basil supposedly warded off the fire breathing basilisk dragon. Maybe Harry Potter should have grown basil for his adventures. But mostly we grow basil to eat. 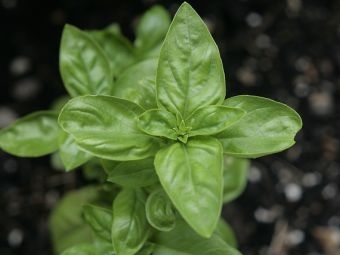 While gardeners know and love sweet or Genovese basil for making pesto and cooking in sauces, there are more than 20 varieties of basil with different flavors, appearances, and uses in food. Thai basil features a licorice taste for Asian cooking. Cinnamon basil is great mixed with fruits. Lemon basil makes a great tea. African blue basil has a camphor scent. Lettuce leaf basil has large leaves used for salads. Basil is also an attractive plant. ‘Purple Ruffles’ features burgundy colored leaves with a sweet basil taste. ‘Thai’ and ‘Cinnamon’ basil have purple flowers and stems making them striking as ornamentals. When growing basil remember they like heat. Plant basil in containers or raised beds where they will get plenty of sunshine and be protected from cool winds. Wait until the soil has warmed to 60 degrees to transplant or sow seeds. Space or thin plants to 1 foot apart and fertilize with fish emulsion to encourage leaf growth. If you’ve had fusarium wilt disease problems in the past grow the resistant ‘Nufar’ basil variety. Harvest basil often to encourage more growth and delay flowering. Pinch the tops of basil once three sets of leaves form to help stimulate branching. Harvest whole stems instead of individual leaves to encourage production of large leaves. Now for this week’s tip, if you didn’t get enough lilacs this year, consider planting a reblooming variety such as ‘Josee’ or ‘Bloomerang’. These will flower again from midsummer until fall. Next week on the Vermont Garden Journal, I’ll be talking about mosquitos. For now, I’ll be seeing you in the garden!